Nell is looking forward to leaving the isolation of her beach and attending University in the city. But when her father reveals she isn’t human, but a product of two warring alien species, her life somersaults as ever-increasing evidence proves him wrong. With friend Sam by her side, she travels to an alien world where she must battle the growing number of enemies and find the hidden book containing the real facts about her ancestry—whatever that may be! Her reading tastes are varied, so too is her writing of highly imaginative, interweaving of Science Fiction and Fantasy, Space Opera, Horror, Romance and short stories. After over thirty years of writing, she still loves her journeys to unknown places, meeting unheard-of peoples. Dale lives in Queensland, Australia. Her home is west of Townsville and that’s south of Cairns but north of Brisbane. 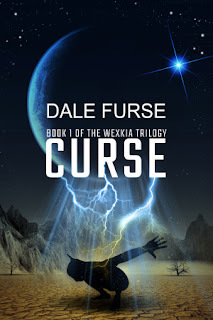 Demonspell, or Curse of the Everlasting Relatives, is the first novel in the Sunspinners series. Along with a big house and income, Elaine inherits five immortal relatives who need constant attention. Try keeping a husband with that set of in-laws. Yes, she has tried. Twice. And failed. Now, just when she meets a great new guy, a band of demons demands that Elaine and her family leave Seattle immediately, alive or dead. 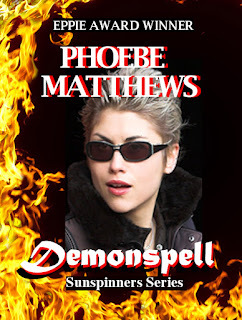 Phoebe Matthews is currently writing three urban fantasy series. She likes a mixture of current events and fantasy and sets her stories in places where she has lived, from Scotland to Washington State. She admires superheroes who save the universe or the planet or at least the whole nation, but admits her own world is much smaller. And so she writes about people with limited powers who have only their wits and courage between themselves and destruction.